The joy of biting into a piece of candy with that rich caramel flavor is such a pleasure. How many people have gone through a box of chocolates, biting pieces trying to find that caramel center? Maybe the solution to that problem is to buy a box with nothing but caramels. Perhaps an even better solution would be to make your own caramels. 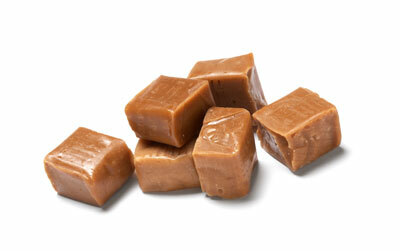 Although variations exist from batch to batch in any confection, some of the primary ingredients in a caramel batch include sugar; corn syrup; shortening (one source of fat in the candies); and some form of milk, cream, and butter or all three. The milk products, which are the most important ingredients, are a primary source of fat in caramel, which gives the confection that delightful texture, and the cooking of the milk solids gives caramel its color. In caramel recipes, the proportion of corn syrup to sugar is usually 1:1 or higher. Typically, a recipe has to contain more syrup than sugar for the simplest of reasons: The excess syrup prevents the caramel from graining, which causes a visible gritty, unattractive appearance in the caramel. You can also get a graining effect in your caramel even with proper proportions if some of the sugar crystals don’t dissolve in the cooking process. For this reason, you need to wash down the inside of a pot at boiling so that any undissolved sugar crystals on the sides of the pot mix with the rest of the batch. Covering the pot for a minute or two has the same effect because the steam generated within the pot dissolves any remaining crystals. Be careful when washing down the inside of a pot: The boiling candy is volatile, and it may splash your hands — especially when you introduce water to the solution. To avoid burning yourself, you may want to put a glove on your hand during the washing process. When measuring the ingredients for the recipe you’re making, measure carefully. Don’t estimate the amounts of your ingredients because cooking is a system of chemical reactions. If you don’t have the proper proportions in your ingredients, you may generate the wrong reaction. When cooking your caramel, you also need to pay attention to your temperature. You want to cook your caramel to a final temperature of 234 degrees F. Accuracy in your temperature is important, so use a candy thermometer. By cooking on low or medium heat, you allow for a gradual rise in the temperature. This gradual rise lets you remove the pot from the heat with the candy at the proper temperature and prevents scorching. You don’t want to cook your caramel too quickly. Ideally, you want to cook it for 20 to 25 minutes after the batch comes to a boil to allow a good full flavor to develop. If you cook your caramel too quickly, you can overshoot your target temperature simply because the extremely hot candy continues to cook a little even after you remove the pot from the heat source due to the ambient heat of the batch and the hot pot. Cooking a little slower allows you to stop the cooking at the end point. A higher temperature results in a tougher, harder-to-chew candy that you may not enjoy. Constantly stirring your caramel as you cook it is essential once the batch reaches the boiling point. Without proper agitation, the high milk content in a good batch of caramel can cause scorching because milk products burn very easily. Stirring the caramel by hand is adequate, but you must continue stirring throughout the entire cooking process once the batch has reached boiling. When a batch reaches its target temperature, remove it from the heat source because the batch will continue cooking even if you’ve turned off the heat. Even the ambient heat of the pot continues to cook the caramel. The following caramel recipe include shortening, but if you want your caramels to have an even richer taste, substitute an equal amount of butter for the shortening, and cook the caramels to a temperature that’s 2 degrees higher than the recipe specifies. This caramel has a short bite, meaning that it doesn’t string when you bite into it, and it’s delicious to eat just as it is. But most folks will want to go at least one step further with this recipe. For instance, you can make caramel dessert apples and caramel pecan clusters, or you can use it in any other recipes that call for a basic caramel. Line an 8 x 8-inch baking pan with nonstick paper. The pan may be smaller for thicker pieces; the ideal depth is about 3/4 inches. Combine the sugar, corn syrup, evaporated milk, cream, shortening, and salt in a 4- to 5-quart saucepan. Bring to a boil over low heat, stirring with a wooden spoon to blend and to ensure that the sugar dissolves. When the batch comes to a boil (about 25 minutes), the batch will boil up in the pot due to the milk and cream. Use a pot of water and a pastry brush to wash sugar crystals down the inside of the pot and clip a thermometer on the side of the pot, being sure that the tip doesn’t touch the bottom of the pot. Continue to boil over low heat. After the ingredients boil up, they boil back down to the cooking level. This process takes about 10 minutes. Stir continuously after the batch lowers, and do not allow it to scorch. When the batch reaches 234 degrees F (after about another 15 minutes of boiling), remove it from the heat and remove the thermometer. Pour the batch into the baking pan and let the mixture cool for 1 hour at room temperature. Cut the batch into 3/4-inch squares, which makes about 75 pieces. Per serving: Calories 37 (From Fat 11); Fat 1g (Saturated 1g); Cholesterol 4mg; Sodium 12mg; Carbohydrate 7g (Dietary Fiber 0g); Protein 0g.